What adverse effects may occur during lung cancer chemotherapy? What are common chemotherapy side effects during lung cancer treatment? What type of symptoms should you watch for, and what can be done to treat these annoying problems? Understanding adverse effects is easier to understand when you consider how these medications work. Chemotherapy drugs attack cancer cells by interfering with the different steps involved in cell division. Cancer cells are continuously dividing and are therefore most susceptible to these medications, but some normal cells that divide frequently (such as those lining the stomach and mouth, hair follicles, and bone marrow) are also affected. Be sure to let your cancer team know about any symptoms you are experiencing during chemotherapy, so they can work with you to make the journey as comfortable as possible. Management of side effects has come a long way over the last few decades, and many of these can be controlled with medications and other therapies. Red blood cells, white blood cells, and platelets are continuously produced in the bone marrow and often affected by chemotherapy. The phrase which describes the reduction of all of these cells due to chemotherapy is chemotherapy-induced bone marrow suppression. Our bone marrow contains the precursor cells (hematopoietic stem cells) which eventually develop into white blood cells, red blood cells, and platelets. When these stem cells are affected by treatment, all of the different cell types are diminished. Your oncologist will monitor these cells with blood counts during your therapy. Nausea is one of the most dreaded side effects of chemotherapy, but ways of managing this symptom have come a long way in recent years. Your doctor may prescribe anti-nausea medications at the time of your treatment in an effort to prevent nausea from occurring altogether. Diarrhea can be a dangerous symptom, often prompting a change in the dose of chemotherapy or discontinuing treatment. Dehydration is also a concern if diarrhea is present. Loss of appetite may occur as a side effect of chemo, but may also be due to the cancer itself. Both nausea and a loss of appetite can result in weight loss. While many people welcome a little weight loss, this can be dangerous in the setting of cancer. Take a moment to learn about how you can manage these symptoms, as well as how to recognize cancer cachexia - a syndrome of weight loss with cancer that is responsible for a significant number of cancer deaths. Hair loss is usually more of a nuisance than a symptom, but it can be distressing nonetheless. 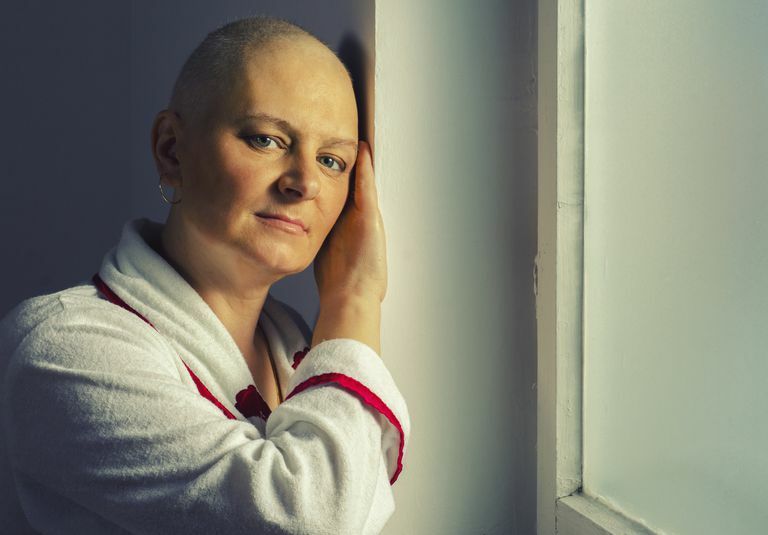 According to research, hair loss is one the most feared side effects of chemotherapy. Some medications are more likely to cause hair loss than others, and hair loss can range from a little thinning to total baldness. It helps to be aware (and frequently comes as a surprise) that all hair can be affected, and it is not uncommon to lose eyebrow hair, facial hair, and even pubic hair. Hair loss usually begins a week or so after the start of chemotherapy and begins to grow back 6 to 8 weeks after completing therapy. Talking about options such as wigs and other head coverings before you lose your hair can ease some of the anxiety at this time. A technique called "reframing" is surprisingly helpful in coping with hair loss if you are still struggling. With reframing, you don't change a situation, but you change how you feel about the situation. For example, instead of grieving your beautiful head of hair, women can smile that they don't have to shave their legs (and men, their faces) for several months. Reframing can be helpful with many of the side effects of cancer treatment but like many things, you may have to "fake it 'till you make it." Of all the chemotherapy side effects, fatigue is one of the most distressing. Unlike ordinary tiredness, chemotherapy-related fatigue is frequently described as tiredness that does not resolve with rest, “whole body” tiredness or a feeling in which even the most mundane activities require effort. Fatigue may begin shortly into treatment and can persist for up to a year, and maybe more, following completion. The first step toward coping with cancer-related fatigue is to understand that it is normal and common. Since there are several "reversible" causes of fatigue during cancer treatment, it's important to mention this side effect to your oncologist. Some causes, such as anemia, can be treated. Most of the causes of fatigue, however, can't be treated directly, but there are still many tips you can follow to help you cope with the fatigue. Asking for and accepting help, and prioritizing your days are musts. Both mouth sores and taste changes can make eating difficult for some people. Mouth sores and taste changes often develop a week or so after beginning chemotherapy and resolve soon after treatment is finished. There are many ways you can alter your diet to reduce your symptoms of mouth sores (and reduce annoying taste changes.) People may find it helpful to avoid foods that sting such as orange juice and much more. For the too common "metal mouth" using plastic silverware may help, as can eating foods with strong flavors. Some medications can cause symptoms of numbness, tingling, or burning in the hands and feet. With lung cancer, this is most commonly seen with Platinol (cisplatin), Navelbine (vinorelbine), Taxotere (docetaxel), and Taxol (paclitaxel). These symptoms may occur early on in treatment and go away, or they may occur weeks to months after treatment, and in some cases may be permanent. Clinical trials are in progress to find ways of preventing peripheral neuropathy related to chemotherapy. Chemotherapy, as well as other treatments for cancer, are physically and emotionally draining. Yet it's also an opportunity to see the glass as half full rather than half empty. During my own chemotherapy treatments, I chose a different friend to accompany me to each of my "visits." I cherish those times to spend several hours with each of these friends without the distraction of kids and... well... life. Managing the side effects can also be an opportunity to not only accept a new normal but to strive for an awesome new normal. I chose to add in therapies such as acupuncture, meditation, and qigong to help me cope, as well as reaching out to friends that "get it" but I hadn't spent much time with. Everyone is different. What can help you not only cope with these symptoms but thrive during treatment?